If you’ve been doing Amazon FBA as a side hustle or for part-time income, you may have had the very same question. The member answers confirmed something I’ve known for some time now: YES, it’s absolutely possible to make retail arbitrage your full-time job! But the conversation about full-time retail arbitrage got me thinking about why this is such a common question. Why do so many new sellers think it’s impossible to make a living selling on Amazon full-time? Sure, some people are just naturally skeptical. After all, there are a few too many “get rich quick” promises out there these days. But for other sellers, I think there’s a mental hurdle about making the shift from doing RA for “fun money” to doing RA to support yourself and your family. It’s a big decision (especially if you’re considering leaving a full-time job to focus on Amazon FBA). So I applaud those sellers who take the time to think it over. To help, I’ve decided to share some signs that indicate that you’re ready to take the plunge and run your retail arbitrage business full-time. Before I get to the 7 signs, let’s take a look at what it might look like to make your Amazon FBA business your full-time source of income. Is it Possible to Be a Full-Time Retail Arbitrage Seller in 2018? Being a full-time RA seller on Amazon isn’t always easy, but it is a very flexible way to make a living. Not only do Cliff and I still personally run a retail arbitrage business, but we also know hundreds of sellers who have built their businesses the same way. Let’s face it, even for sellers who eventually expand into wholesale or private label, they just can’t resist the RA ROI! 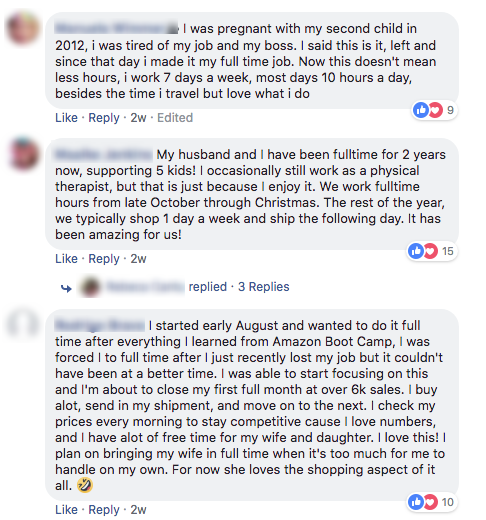 As I browsed through the replies in the Facebook post, I noticed that being a full-time seller looks different for different people. Some full-time sellers really just focus on Q4. Makes sense given that you can make over half of your yearly income in just about 2 months of peak holiday selling. Others maintain more “part-time” hours of sourcing and shipping throughout the year, but are still able to earn a full-time salary! I even have students doing this full-time…..from an RV! And that’s really the beauty of running a retail arbitrage business. You can set your own hours and find a rhythm that works for you. So, if you’re still here, I imagine you’re considering making the switch. What do you think - are you ready? I want to remind you of a few things. This business is different for everyone. Only you know the needs of your family and your business. What’s right for one person might not work for you. And on that note, there’s no one timeline for going full-time. Some sellers do full-time retail arbitrage right away, while others stay part-time for months or even years. I truly think that you’ll know when you’re ready. But just in case you need a nudge, here are 7 signs that you are definitely ready to go all in on Amazon FBA. A lot of new Amazon sellers are attracted to the retail arbitrage business model because you can get started without a lot of capital (aka money to spend on your biz). If you’ve only got a few hundred bucks to spend on inventory, you don’t really need 40 hours a week to spend it! So it makes sense that most new sellers start their Amazon businesses on a part-time basis. But if you reinvest most of your profits back into your business, you’ll eventually have more and more capital to spend on inventory. And after that, you’ll have enough to pay yourself a salary and still have more to spend on the business. Suddenly it may take 20, 30, or 40 hours a week to spend all of your available capital (plus the time it takes to ship the items off to Amazon and manage the business). If your business capital is just sitting there, it’s not making you any money. So it’s up to you to find the time to get out there and source and ship! Surefire Sign: If you have too much money (ha!) and not enough time, then you might be ready to work full-time on your Amazon business. With the added hours, you should be able to generate even more money to reinvest! Some sellers start their Amazon businesses as a way to get out of an unfulfilling 9-to-5 job. Others start selling just to make a little extra cash….only to realize that the side hustle (Amazon) is way more fun than their regular job! So, what do you do if you absolutely can’t stand your day job? If you have enough capital saved up, you can take the plunge, give notice, and get ready to get out there and source! If you still only have a little money to spend on inventory, you might need to make a plan on how you could get there quickly. If you need to quit your boring job like yesterday, you can quit and try to make it work. It’s a little riskier than quitting with some savings, but I’ve seen sellers really motivated by this tactic! If you’ve got bills to pay, you’ll definitely be out there scanning every item in every store! Surefire Sign: If you spend most of your 9-to-5 hours daydreaming about clearance aisles, you’re probably ready to tackle retail arbitrage full-time! I was so happy when I was able to bring Cliff home from his corporate job. Not just because we got to work together (aww), but because it meant we could grow our business that much faster! Retail arbitrage is a very demanding business. This isn’t some make money while you sleep thing. There’s crowded stores, heavy boxes, and of course Scotty Peeler injuries to deal with! It’s a lot easier to handle the work full-time if you have some support. Having a trusted business partner by your side can really help. You’ll probably fall into some natural roles when working together. Like when we list, I do the actual listing at the computer and Cliff handles all of the prep and labeling. Maybe your adult daughter could handle all of the sourcing while you focused on listing, shipments, and bookkeeping. Even just “hiring” your younger kids to remove labels or do a polybagging assembly line can really help! Surefire Sign: If you’re at a point where you need more man-hours from a partner or an employee, that’s a good sign that your business is ready to support you full-time. 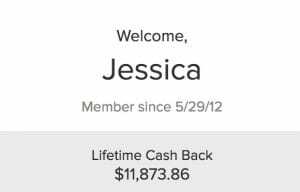 As I touched on earlier, if you’re new to Amazon and you don’t have a lot of cash, it’s best to reinvest all of your money back into your business. This is what allows you to grow your business to a more sustainable level. If you can do that for at least 3 months (more is better! ), then you can start to pay yourself a salary. Your salary may be a fixed amount (say, $500 from each of the two Amazon payouts each month). Or maybe you’d rather set it up as a percentage (so, 25% of your monthly profit). However you do it, this amount may start out small. Too small to pay the bills most likely. But as long as you’re still reinvesting some of your profits and growing your business, then this amount should increase. If you’re only working part-time but you’re able to pay yourself a good salary and still grow the business, then that’s a great sign. Because when you switch to full-time, your growth should be that much faster. Surefire Sign: If your profit increases month-to-month and you’re also paying yourself a salary (even a small one), you could consider making retail arbitrage your full-time job. And if I were going to pick one time to just arbitrarily quit a full-time job to focus on Amazon, it would be at the start of Q4. Some will argue that things don’t really pick up in Q4 until November, but giving yourself October to “learn the ropes” of full-time selling will help you ease into it. There is honestly just so much to buy in Q4 that almost any seller could make RA a full-time job in November and December. So if you’ve been waiting for the “right” time to ramp up your biz, October might be as good a time as any! If you’ve only done Q4 as a side hustle, you’ll be blown away by just how busy you stay as a full-time retail arbitrage seller. Once you start adding in road trips to hit every Walmart in the state, you’ll see the potential of filling 40 hours a week with scanning and shipping! It makes strategic sense, too. If you work full-time on your Amazon business during Q4, you stand to make a lot of profit. This means that you’ll be able to comfortably pay yourself, grow your business, and still save some money to invest at the start of the next year. 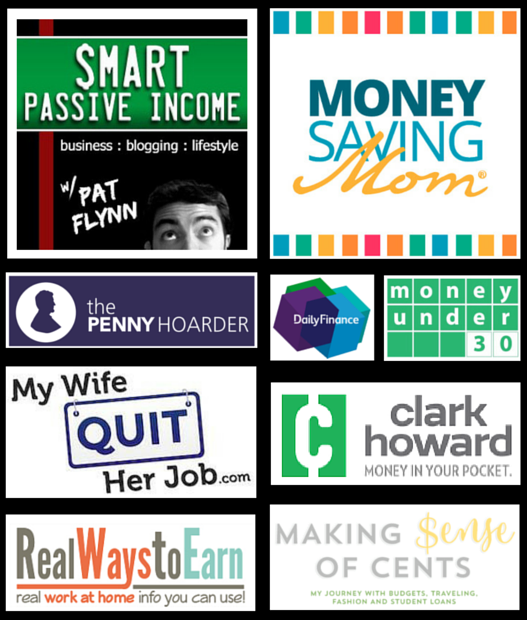 You can really use Q4 to launch a successful new year as an online seller. Surefire Sign: If your local stores have out Halloween and Christmas displays, things are about to get wild! It’s a great time to go all-in on Amazon! Sellers who start out part-time on a budget often have the best foundation for building a full-time business. That’s because most people who are running an Amazon business on the side are running a pretty lean business. That means that they keep their costs down to make maximum profit on limited resources. One way to blow through your profits and inventory budget is to load up on non-essential tools, services, and extras too soon. Yes, it’s nice to have the latest gadgets and slickest software, but doing so when you’re trying to build your way up to a full-time income is not the time! If you’ve been running a lean and efficient part-time retail arbitrage business, you’ll be in a great place to transition to full time. Of course, once you are working full-time hours (and making full-time money! ), you can start to invest in more tools for your business. Let’s face it, the right tools can make you a lot more money, so they’re great to have when the timing is right. If it's a slow time of year for RA sourcing but you're still having consistent sales, then you could explore online arbitrage tools or other business upgrades. Over time, you’ll see the beauty of investing in better tools and trainings to grow your business. But if you’re saving up, stay lean and nimble! Surefire Sign: If most of your capital is going towards inventory and other essentials, your business is probably in a great position to grow quickly. Some sellers never planned on doing Amazon full-time. But after being laid off, they have no choice. Look at it as a blessing in disguise! I know that’s what it was for me. If you’re laid off while you’ve been doing Amazon on the side, consider yourself lucky! Some people don’t have a side business like retail arbitrage to fall back on. Maybe being let go was just the motivation you needed to commit to never working for a boss again! Let that fuel your fire to get out there and make the most of the Amazon FBA opportunity! With all your newfound free time (sure, let’s call it that! ), you can really focus on sourcing and shipping as much as possible. Surefire Sign: If you’ve lost a source of income, why not double down on your Amazon business and make it work full time! I hope these signs give you something to think about! Has this inspired you to do retail arbitrage full-time? Let me know in the comments if you have any questions about making the transition. Of course, if you’re already a full-time retail rockstar, please share that in the comments, too! It just might inspire someone else to get started! loved this blog post. cant wait to take your course. My husband and I have been doing RA for 3 1/2 years part-time. We enjoy it, but we have struggled to be able to take much out of it for ourselves. We have been working it debt free which limits our capital, but I think we struggle more with reading the keepa charts to make better buying decisions. I would love to do this fulltime, but right now I can’t picture that happening. I’d love to get started on this but have many questions. Here’s one about shopping: If you’re going to Walmart, Target, etc., all the time buying tons of one or two items at a time won’t the employees get angry at you? Plus they’d get to know you after awhile and ban you from the store. At least that’s what it seems like to me. Because you’re buying their popular toys (for example) so the customers won’t be able to. Does that happen?Thanks.